Stress is a part of life. In fact it would not be an exaggeration to say that if there is no stress, there is no life. Or to be more accurate, different situations have the probability to cause stress every single moment of your life. Stress is nothing but the perception of the degree of threat. If we perceive something to be threatening (even unconsciously), the body activates all stress response mechanisms. Continuous activation of these stress response mechanisms leads to internal fatigue and long terms metabolic and hormonal changes impacting the entire internal body and all the systems. This adverse impact leads to various minor or major diseases. Ability to genuinely and consciously relax. 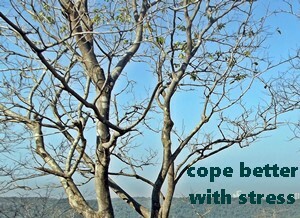 This response to stress or the strategies deployed are therefore known as coping. How we cope with perceived adverse situations is a strategy. An integral part of stress response is coping with the stress (psychologically). Based on an appraisal of the situation, the mind will implement a stress response or reaction. The body will then follow this decision response or reaction to support the mind’s decisions. The body does this by making rapid physiological alterations. These are so rapid that in many situations, physiological changes occur within a few seconds or even within a fraction of a second. This process is geared towards reducing the threat perception as well as the state of mental and physiological arousal. This is done by undertaking an action or set of actions to bring forth a positive result. ‘From a stress physiology point of view the actual action or performance is not important. What matters is the perception of being able to cope that reduces stress’. What the above statement means is that the mind should think that it can cope up easily. Actually speaking, no action may be initiated. Based on this understanding and past experiences, the mind and body builds up a pattern to perceive or ‘cope’ with stressors (stress causing situations or elements). Aggressive or dominant – Many individuals always react in an aggressive fashion and try to dominate. If a few times in the past, the individual gets his or her way by being aggressive, it gets ‘stored’ or hard coded in the mind. In most situations, the standard response would be to bull doze, insult or get angry at others. This sets up a cycle of perception and responses, making the person ‘hot headed’, dominant or egoistic. Meek or Timid – There are individuals who respond or react by trying to ‘submit’ in the hope that the situation will get resolved. Such individuals will tend to be looked at as meek or timid, even though they may be intelligent. Indifferent – Many a times, indifference is deployed. It is genuinely ignoring a situation assuming it will resolve itself or thinking that it is not too important. Such individuals may come across as aloof and indifferent. Hopelessness – this is a condition where the mind perceives (correctly or incorrectly) that most responses will reach a negative result. This means that the individual is convinced that whatever he or she does, there will be no improvement in the prevailing undesired situation. A prolonged state of hopelessness may lead to depression. These individuals are the sad looking ones with a fatalistic outlook. Alternatively, they may be very lively but with suicidal tendencies. Similarly, there could be various other personalities which get ‘shaped’ by stress and how we react or respond. Once we are aware, we can bring about some changes to make our coping strategies more balanced and situation specific. This will help us to avoid getting ‘hard coded’. There are various coping theories put forward over the years; some with a lot of technical terms and jargon and yet others which are simpler to understand. Most of them address the ‘why’ and ‘what’ theoretically, but none really address the practical aspects of how to cope. This is addressed practically and effectively by our stress management handbook (which is available free) and practical stress management programs. Sign up with wellzee to become a better individual.